On Mitch's advice, I have set up a separate thread for Non-Pixar related graphics, although I have been posting Non-Pixar graphics in my original thread for a long time... but well, rules are rules. I'm just a law-abiding citizen! Haha, but yeah, well, here we are. What better way to kick off a brand-spanking new fanwork thread than some awesome graphics from the brand-spanking new Princess and the Frog trailer! I must warn you, beforehand, if you have not watched the trailer, do not look at the graphics below if you do not wish to be spoiled. If you have, then you can go ahead, since all of them are just screenshots from the trailer. If not, go see it first right now , then get back to me. Here's my current avatar. If anyone can guess the reference I'm making (it's a famous trope from a Don Bluth movie), then you win a free year's supply of energy, thanks to the best energy company in Monstroplis, Monsters Inc.
Obviously if you're a Pixar fan, you should catch the source of this quote straight away. Dr. Facilier's skull mask reminds me of Achmed the Dead Terrorist. I 'censored' the actual quote (It's not so much a rude word, as more of a strong threat used to comic effect), which you can watch here. Lame Casablanca reference. And yes, I know she's technically a frog, but 'toad' just sounded more like 'kid'. Prince Naveen is such a lothario! And we end with my current sig. It's the least 'spoiler'-ish, so I'm wearing it. This series is not particularly 'fancy', but it was good practice with font styles and text arrangement. Every sig has a different font (with 'Here's Looking at You' with two!). Anyone is welcome to wear these sigs, the only 'payment' I ask is that you credit me. I'm hopping mad (excited) for PtaF! thedriveintheatre - First of all, thanks for creating a separate thread on the matter. I don't think I noticed that you'd been posting non-Pixar graphics in your other thread, but, in any case, I appreciate your consideration! Awesome graphics! I love the references to A Bug's Life and Casablanca, and the text only adds to the delectability. The fonts, in particularly, suit their graphic counterparts well, especially the "Mr. Looney" one, in my opinion. (And, correct me if I'm mistaken, but is that the "Marker Felt" font for "Toad" in that first signature?) My favorite of the bunch has to be the "Silence Please" one. Edit: Oh, wait.. wait!!! I know what it's from!! It's from that spoof of Fern Gully by "that guy with the glasses" dude. B.L.A.M. stands for a "Big-Lipped Alligator Moment". Gosh, that was so funny. Nice work, dude! Keep it up. They're all terrific, TDIT! I like the other movie references. And the last one is in the perfect spot as well, because it's like Prince Naveen's asking if you like any of the above sigs and avvies! Looking foward to more! I don't think I noticed that you'd been posting non-Pixar graphics in your other thread, but, in any case, I appreciate your consideration! I didn't really think the sig Mr Looney was that impressive, so wow, thanks! I'm afraid you're wrong on the word Toad's font. It's Brush Script Std. Yes, 'Silence Please' was my favourite avatar in terms of font. Handwriting - Dakota looks creepy for some reason. Your ma worked for the Don Bluth? Your family is so cool! And yes, that was from ADgtH, and yes, it was a reference to "thatguywiththeglasses"! Congratulations, you've won a free one-year supply of clean, reliable energy from Monsters Inc! Unfortunately, this prize can only be redeemed by residents of Monstropolis, so you'll have to move there to be eligible for this offer. And the last one is in the perfect spot as well, because it's like Prince Naveen's asking if you like any of the above sigs and avvies! Wow, I never thought of it that way, BDD! Ha ha, thanks! disneydutchess - "Let's make music together! Let's make sweet harmony..." I love that alligator. TDiT: That alligator is hilarious. thedriveintheatre - Ha-ha! Yep, I agree: Separating the Pixar graphics from the non-Pixar ones will keep your original graphics thread clean and less cluttered. Thanks, again! Cha, my mom worked on The Secret of NIMH. She was an assistant animator and did clean-up work on such characters as Mrs. Brisby, her children, and Jeremy the crow. Unfortunately, she didn't get credit for her work, but I think it's still pretty cool that she was part of the crew! You're welcome, by the way! thedriveintheatre wrote: I'm afraid you're wrong on the word Toad's font. It's Brush Script Std. 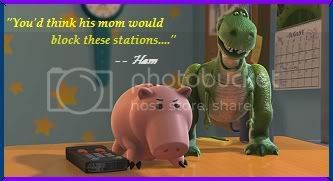 thedriveintheatre wrote: Congratulations, you've won a free one-year supply of clean, reliable energy from Monsters Inc! Unfortunately, this prize can only be redeemed by residents of Monstropolis, so you'll have to move there to be eligible for this offer. Ha! You've got such a funny sense of humor. 'Ere's some graphics from two of my summer obsessions... Transformers: Revenge of the Fallen and Ice Age: Dawn of the Dinosaurs. Thanks for putting these up! 'welcome, woody. Feel free to use them if ya like 'em. I hope the next one isn't too much of a spoiler, but I think most of you have already seen the film and I chose this instead of the close-up shot. Yes, thanks for encouraging me to use the 'Heart Melting' pun. I hope I didn't spoil too much if you haven't watched the movie. The Mr and Mrs Scrat avatar is a spoof of the poster from one of my favourite action-romantic-comedies in recent memory, Mr and Mrs Smith. I just knew I had to parody it when I saw their poses from the 'Games' section of the official site! As for the Coralion sig, I'm aware of it (I read your PM), but I'm posting it with another member's sig request once I've finished his, as it looks better as a 'set' (and so that all the Ice-Age related ones are in one post). I'm just neat that way, but thanks for the suggestion! thedriveintheatre wrote: The tagline for the Buck sig was taken from Hook, one of my favourite childhood movies, but I think it's always been Peter Pan's catchphrase anyway. Oh, I remember Hook! Awesome movie, I need to watch it again for the good of the little kid within me. I don't recall hearing that quote (another reason to watch it again), but it's the perfect quote for that signature 'cause it's totally Buck's character. Really? That's very interesting. I never knew that. Well it sure fits Peter Pan's adventurous, bold spirit, that's for sure. The Mr and Mrs Scrat avatar is a spoof of the poster from one of my favourite action-romantic-comedies in recent memory, Mr and Mrs Smith. I just knew I had to parody it when I saw their poses from the 'Games' section of the official site! Yep, I knew I saw that style before! Your parody with Scrat and Scratte is hilarious! ...but I'm posting it with another member's sig request once I've finished his, as it looks better as a 'set' (and so that all the Ice-Age related ones are in one post). I'm just neat that way, but thanks for the suggestion! Here's the sig I was commisioned by BDD to do for the promotion of her Coralion mash-up trailer! Thanks again, BDD, you were a very patient 'client', so thanks for putting up with my delays! It was fun to have worked with you, and I look forward to another collab in the future. And here's my current avatar. To commemorate the 40th anniversary of the lunar landing, it's Kevin Spacey's character from the sci-fi indy, Moon, with a Pixar twist! His robot Gerty has endeared himself to me from the trailer, and I can't wait to see this if it ever gets a release Down Under!